The aims of this chapter are to evaluate the main determinants of the inflow of FDI into selected countries of CEE and to examine the volume, dynamics, and structure of FDI inflow into these countries. Due to certain similarities, the authors focus the analysis on four countries: Poland, the Czech Republic, Hungary, and Slovakia. The reasons are geographic proximity, political, economic, and cultural similarities, as well as shared experiences of economic transformation. This chapter focuses on matters pertaining to foreign direct investment, mostly on the reasons motivating FDI inflow in light of selected studies and theories. The authors also provide characteristics of the dynamics and structure of FDI inflow into the V4 countries. The final part of the chapter compares investment attractiveness, the system of incentives, and identifies barriers facing investors in the analyzed countries. One of the main features of the modern economy is the internationalization of economic operations, which is connected with globalization and regionalization, This consists mainly of establishing and developing transnational links among companies. These links may take various forms, starting from simple ones (e.g. exports) up to the much more advanced channels of international capital flows. One of the ways to expand into a foreign market is foreign direct investment (Stawicka, 2007, p. 7). As mentioned, foreign direct investment (FDI) is linked to regionalization and globalization, particularly when it comes to the selection of investment localization. Regionalization may be considered at two levels. Firstly, there is international economic integration, i.e. the establishing of regional integration groupings (regionalization of the world economy). Secondly, there is also the currently observed phenomenon of increased importance of regions and their emergence as separate structures (regionalization of national economies). Globalization, in the context of economic development, may lead, on the one hand, to differentiated effects and marginalization of some areas and, on the other hand, to the increased importance of a territory and location as a source of competitive advantage. Thus, we are dealing with two apparently contradictory phenomena, whereby globalization increases the importance of a territory at the regional and local level. In the literature this is referred to as glocalization (Robertson, 1994; Svensson, 2001; Swyngedouw, 2004; Pietrzyk, 2004). International capital flows, also in the form of FDI, are among the main factors conducive to globalization. At the same time, investors are seeking locations that would meet their specific expectations and boost business development. The countries of Central and Eastern Europe (CEE), when implementing systemic transformation at the beginning of the 1990s and opening up their markets for foreign investors, also had to face these new trends in the global economy. Since 1991 these countries are also members of the Visegrad Group (V4), established with the initial objective to support the aspirations of Poland, Czechoslovakia (later the Czech Republic and Slovakia) and Hungary on their path to EU accession. After 2004, in accordance with its Declaration, the V4 has aimed at optimum cooperation with all countries, in particular with its neighbouring countries, and its ultimate goal is the development of democracy in all parts of Europe. Moreover, its members support the building of European security based on cooperation and coordination within existing European and Transatlantic institutions and structures. These countries are also connected by their cooperation within the structures of the European Union (EU), NATO, OECD, and WTO. The countries of Central and Eastern Europe by offering relatively good location and human resources at relatively low operational cost, and by investing in infrastructure, they became attractive investment locations. For over 20 years Central and Eastern Europe in particular the Visegrad Group countries, has become an ever more attractive destination for long-term capital investment. 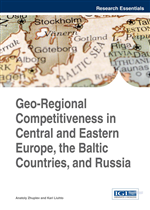 According to the assessment of Ernst & Young, Central and Eastern Europe is the third the most interesting investment region globally (Ernst & Young’s, 2012). The reasons behind this are not only systemic transformation and the opening up of their economies to foreign investors, but also general security, related to membership in international organizations and being a part of the European single market. The countries’ EU accession in 2004 particularly boosted investors’ interest in the region, providing the guarantee of stability and relatively high economic and legal predictability.